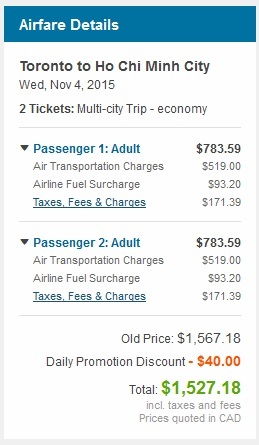 United Airlines and ANA are showing some pretty amazing prices on open jaw flights from Toronto to Ho Chi Minh City, Vietnam and then back home from Bangkok, Thailand, all for just $763 after taxes. The available date combinations are very limited, to certain dates in November. 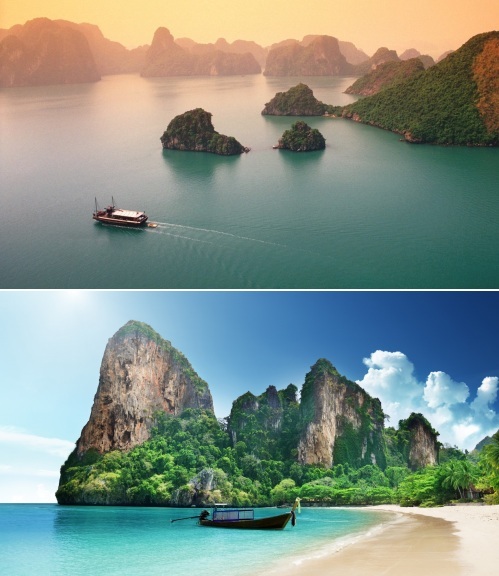 As for getting from Vietnam to Thailand, flights from Ho Chi Minh City (SGN) to Bangkok are pretty reasonable, at around $109-$130 after taxes, on airlines like VietJet Air or Jetstar or AirAsia. Note that the low cost carriers may sometimes use Bangkok's DMK airport, instead of BKK. Alternatively, you could meander over from Vietnam to Cambodia to Thailand at your own pace by bus, which will cost about $42 CAD total. The total amount of bus time involved is about 18 hours. toronto, yyz, flight deals, bangkok, thailand, asia, southeast asia, bkk, united airlines, ho chi minh city, saigon, vietnam, sgn, ana all nippon airways, dmk, vietjet air, jetstar and airasia.